By now the Loth-cat is out of the crate-- Ahsoka returned in the TV show Star Wars Rebels! 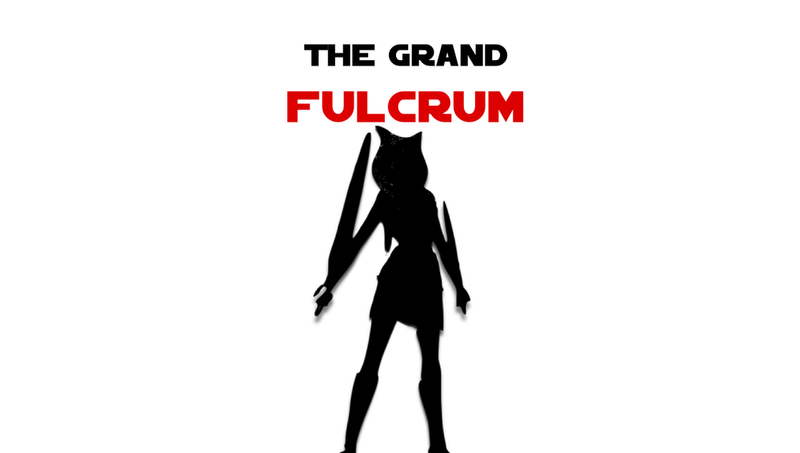 She was Fulcrum (or at least the “Grand” Fulcrum)! Even before the mystery was solved, very investigative fans deduced the connection. But boy was it a wonderful moment to have those months of speculation finally validated. Ahsoka was back. She was back! Ahsoka Tano’s journey in The Clone Wars story was an uphill battle to a good chunk of fans. She was older than the age Anakin Skywalker was introduced, but we only got a movie of little Ani before he sprouted to the Skyguy seen in Attack of the Clones. She was a little younger than the age Luke Skywalker and Leia Organa were introduced, and they were almost at their defining age. Ahsoka being stuck in the middle had to grow into her role as Padawan Learner to Jedi Knight Anakin Skywalker, and that took time. I am happy they did since it gave fans something to look forward to! It is even happening again in Rebels, with Ezra Bridger. Now that we know Ahsoka lived, and that she joins the cast in season 2… What happened to her? That is where the Ahsoka novel comes in! Though a question rises in my mind. When should fans read the novel Ahsoka? I did not start watching The Clone Wars until it was off the air, and on Netflix. When I found it on Netflix, I binge watched the show in Chronological Order (found here). During my binge, I did not know about the wave of negativity directed toward Ahsoka until much later, when I heard about it in an interview with Ashley Eckstein, who voiced the character. One of the biggest stories that brought me full speed back into the Star Wars fandom was The Clone Wars. Why was it so disliked? The stories all intertwined. It was a bit chaotic at times, but so is war. However, there was so much more to learn from each story. So much it reshaped how I saw the preexisting characters and discovered the wonderful new additions to the Star Wars universe. I might have gotten into the series sooner if I had known more about the show. During the time The Clone Wars was on the air, I had started to drift from Star Wars fandom. No one I knew talked about it much. I almost jumped on board to check out The Clone Wars… Then MC Chris happened. One of his skits was about explaining the show. Explaining how the show was all sunshine and rainbows to characters that end up dead and gone or worse. The way he talked up the show in his comedy turned me off from even checking out the series. It wasn’t hard. One of my friends at the time was against everything that wasn’t the original trilogy. That was his viewpoint. For better or worse I was influenced by my surroundings. But all that changed a few years ago. I relived the movies, with my wife, binged through The Clone Wars, jumped into the Legends novels and comics, and then all the canon material I could get ahold of. After all of that, I started writing about my passion for Star Wars. So the Ahsoka novel was right up my alley to get into. The story of Ahsoka’s journey from The Clone Wars to Rebels has been a question on so many fans minds ever since she arrived at the end of season one. How did she survive? What does she know of the events of Revenge of the Sith? Where did she go? How did she get those white lightsabers? The novel by E. K. Johnston began to unravel those threads. By now multiple reviews of Johnston’s young adult novel Ahsoka have popped up. I was not able to get an early review copy (the ARC looked so wonderful), but as Yoda once said, “Patience you must have my young Padawan.” My focus in this article is about the echoing effects of the novel to the Rebels TV show instead of a straightforward review. If you are curious of my opinion of the novel. I enjoyed it so much! Lots of #fangirlflailing was to be had. Lots of gasps! So much goodness! The novel was designed to bridge The Clone Wars and Rebels, and it did so in spades. Ahsoka was back. Even better Ashley Eckstein reprised her role as the narrator of the audiobook! I was one of the many fans hoping she would be hired to voice it. I was so pleased, with the results. She didn’t try to be completely accurate, with some of the more “defined” characters (like Bail Organa), but the emotion was genuine. It did feel like Ahsoka was reading her own novel aloud. The novel is set one year after the events of Revenge of the Sith. After the fall of the Republic. After all, her friends died. But Ahsoka was back. She was still moving forward. In the novel, there are micro flashbacks spread throughout. Precious moments. Moments in time that could never be forgotten. No matter how hard a Dark Lord may try… Because of these little moments, it feels like reading the novel before Rebels is the way to go. One could, however, read this between season 1 and 2 of Rebels, but there is something about knowing she is alive that sparks a fire across the first season of Rebels. First, in Sparks of Rebellion, we would see the Grand Inquisitor teased in the opening/closing moments of the movie event. In the Ahsoka novel, an Inquisitor is introduced, and the Grand Inquisitor lingers in the shadows at the end of the novel. By reading the novel first, there are more clues to the mystery of his character. In addition, we learn the power level of one of the Inquisitor’s in the novel compared to Ahsoka, which further clues the reader into the low-level Kanan had become since abandoning his lightsaber skills. Second, the episode Droids in Distress takes on a whole new perspective. R2D2 and C-3PO show up on a secret mission. Okay. Bail Organa and the Tantive IV show up hinting that he will be looking closer at the Ghost Crew. Squee! The possibility of Ahsoka learning about the Ghost crew or showing up grows exponentially as the novel reveals that Ahsoka is connected to Bail in the rebellion. Holy buckets! That begins the gears turning. The tightening of tension that she might show up soon in the show. Ahsoka was back. Plus, the extra story of Bail in the novel adds to his character, and how big a risk he took in meeting Kanan face to face! Third, the teases of Fulcrum throughout the first season were great, when we didn’t know (totally knew) that it was Ahsoka. But once a secret is known. It cannot be unknown. (Loth-cat, crate, outsideness, etc). Now that we know that it was Ahsoka and that she was a middle person to communicate to all the rebel cells, it became a constant reminder that she was around. Ahsoka was back. The tension tightening more as the absence of her character was still being felt. Until it all burst, when she finally was revealed! All the moments building throughout the first season. Taken individually they were great. Mixed all together created a song of her return loud as day. All helped by the extra context the Ahsoka novel brought. In addition, there are connective tissues to moments in season 2 of Rebels from the Ahsoka novel. They mostly were revealed in the flashbacks of the novel. Hints of Captain Rex's escape. Snippets of the Siege of Mandalore. The power Ahsoka has over the kyber crystal’s song. There are also little nuggets of possible ties to season 3! Will we meet an A-Wing pilot that was introduced in the novel? What about if we will learn about the possible romantic ties that Ahsoka may or may not have had? Will the events on Illum be revealed as a certain base of operations to a new order? Who was that Black Sun bounty hunter? I would be remiss to not include two Legends novel suggestions to read before the Ahsoka novel. The first is the Kenobi novel by John Jackson Miller. Set shortly after Revenge of the Sith, the novel takes place over the course of a few weeks. Obi-Wan Kenobi is just getting settled on Tatooine. He is trying to stay out of trouble. Yet every time he runs into the locals chaos ensues. The novel is a blast to read, even though Kenobi is purposefully absent in a good amount of the novel. The second is Dark Lord: Rise of Darth Vader novel by James Luceno. The novel was written way before The Clone Wars TV show was released, so a good chunk of details have shifted (example: no inhibitor chips, Tarkin’s remarks on Darth Vader, etc). However, there is some stand out moments. One of my favorites is the sequence that involves Darth Vader going to Alderaan… Where baby Leia, R2D2, and C-3PO are at… Hidden in plain sight. Won’t spoil what happens, but it was an intense chapter.